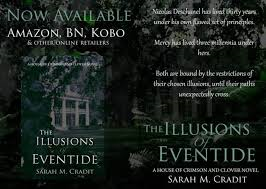 The Illusions of Eventine by Sarah Cradit is a December 2013 release. I was provided a copy of this book by the author in exchange for an honest review. The story picks up with Nic still licking his wounds over the revelation that Oz and Ana had been intimate. As usual, he thinks everything is about him. He did take it pretty hard and his heart is broken, which is a new experience for him. He has decided to travel to his private island, knowing it would be deserted, with some very dark thoughts. Before he even gets a chance to think about things, he discovers a woman has washed up on his beach and is nearly catatonic. Instinct takes over and he gets her to the house to take care of her. This begins a journey for Nicolas that will reveal to him his ancestry. It will explain a lot about who he is. He will realize that he is capable of love and compassion and will learn to think of others with empathy. Of course, Nicolas's cousin, Ana will play a part in all of this. She is struggling with something that happened in Maine. She is still with Finn and loves him very much. She feels better after clearing the air between them, but she still thinks she is toxic to him and must end things. As Ana comes home to New Orleans she finds herself immersed in Nic's situation with Mercy, the woman he encountered on the beach. Little do they know that the whole thing was orchestrated by someone that is watching their every move. The family will be stunned to learn of their heritage and Ana in particular will see her life take on a whole new direction she never dreamed of. This chapter in the Crimson and Clover series takes on a new direction from the previous installments. This series has the potential to go off in so many wonderful directions. Each book is better than the last. This one is the best one in the series to date, and I love all the other ones too. Nicolas is still Nicolas- but he will be challenged in a way he never dreamed. Ana is still tormented by her past mistakes and whatever secrets she holds, and Oz is still the stable best friend with a troubled wife. The three of them will learn to put the past to rest while their lives become more complicated. Mercy is a new character and is central to this story. You will really like her and the number she does on Nicolas. Another new character is Aidrik . He will become central in Ana's life. The focus of this novel deals more in the paranormal realm. I felt it had the tone of a fantasy novel or science fiction leanings, but it would be up to the reader's perceptions on that. It was just how I felt about these new characters and their connections to the Deschanel family. Ana finds she is in the position of still being in love with Finn and being bonded with Aidrik. The new book will explore that story in detail. I am really looking forward to that one! 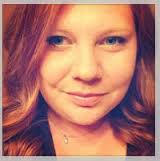 It is my pleasure to welcome Sarah Cradit to The Book Review today! Thanks so much for stopping by! 1) The House of Crimson and Clover series took a different direction in The Illusions of Eventide. Was that a planned departure or what it just the direction the characters took you? Great question! There’s a long answer, and a short answer. I’ll try to find a middle ground. The first book, St. Charles at Dusk, was initially meant to be a standalone. But in hindsight, I realized I’d created a huge, elaborate world with dynamic characters. It would be a shame to let them live and die in one book. They called to me; they had more to say. So, I wrote The Storm and the Darkness, and, as I did, some of the mild paranormal elements emerged. As I was writing The Illusions of Eventide, I knew it would be a story where Nicolas met his female match. But no ordinary woman could ever be that. Mercy, then, began to emerge, and as I wrote her, her world also began to develop. And once it did, so many other things fell into place…the family heritage, the traditions, rare abilities. The tie-in was perfect. Part of me thinks my subconscious had been working this angle all along, slowly bringing me down this path, though the truth is, I got lucky with my brainstorming. Whatever the case, I’m thrilled with the direction the series is going. It feels like the natural next step, and the right way to bring the stories forward. 2) Nic is quite a character. The more I read about him the more I find myself liking him, despite his personality. Is his character based on anyone in particular? He wasn’t based on anyone, but he developed as a fun, male counterpoint to Oz. I liked the idea of someone who was crude, and carefree, but dimensional. Nicolas is obnoxious (amusingly so), but he is also one of the most loyal people in the series. And, if I’m behind honest, I sometimes live vicariously through him. Nic says the things we’re all thinking, but are afraid to say. 3) I love New Orleans. It's one of my favorite cities. Will the series continue to have it's home base in New Orleans? Absolutely. My love of New Orleans is what started this series, and remains the backbone. It will always play a significant role. Having said that, I am also looking at building out Farjhem, in Norway, as another primary setting. But New Orleans will always be a critical centerpoint. 4) Are people choosing sides between FInn and Aidrik? They are! I can tell you, Finn is winning. Aidrik has not won many hearts, with his brusque speech ad his mild manipulations ;). But I will be very interested to see what fans think of the direction that triad takes in Beyond Eventide: Bound (the follow-up novella, coming out in April). It might shock some folks. 5) Where can readers contact you? Where can we find your books? Readers can always contact me, even if just to chat. I love talking about the books! 6) What do you enjoy doing in your spare time? Spare time is an abstract concept for me. Because writing is my day job, I often spend most of my evenings writing, or working on something writing related (covers, marketing, promos, etc). On the rare occasion I’m not wrapped up in the world of Crimson and Clover, I’m usually reading. 8) What are your top five favorite books? Difficult question  I’m going to cheat a little and lump series’ together, because I’m a big series reader. Honorable mentions (I may re-evaluate them for top 5 contenders once the series’ are over): Outlander series by Diana Gabaldon, and The Song of Ice and Fire by George R.R. Martin. I have a few projects coming out the first half of 2014. Surrender is a novelette I’ve worked on for the Novel Grounds anthology, All Our Love, coming out March 11th. The core story is taken from the Storm and the Darkness; specifically, the flashback scene with Ana and Oz on their prom. I’ve taken that and built out a sweet, coming-of-age love story. I’ll also be releasing it on my own, later. Beyond Eventide: Bound is a novella coming out April 21st, and picks up where Eventide left off. The story begins with Finn deciding he must go after Ana, and he takes off, with two of her cousins, for Wales, where he prepares to make an interesting proposition. I am also working on a re-release of St. Charles at Dusk. I’m taking out some content, and also retrofitting it with some of the paranormal elements, to help make a more natural transition from that book to the next. Toward the fall, the next full Crimson and Clover book, Empire of Shadows, will also be coming. 10) Do you have a favorite quote you would like to share?